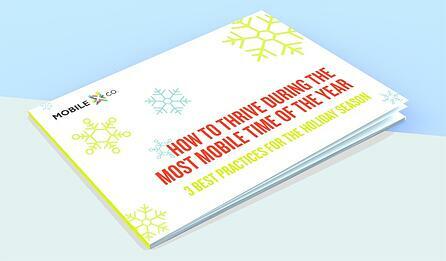 3 Best Practices To Help Marketers Thrive During The Most Mobile Time Of The Year! There'll be much mobile shopping, and thumbs will be tapping. It's the most mobile time of the year. Hard to believe the holiday season is right around the corner. Soon shoppers will be online and on mobile to find the perfect gifts for their loved ones. It's not too late to prepare for this ecommerce shopping frenzy. Discover tips to actively engage shoppers. Understand what it means to optimize for mobile. And, how to keep cart abandonment low. Access your copy of our Holiday ebook by completing the form and clicking download now. By submitting this form, you agree to receive emails from MobileXCo containing super awesome content that will provide best practices, industry news, free content downloads, and our latest features. We believe in quality over quantity, you can expect to receive up to four (4) messages per month. To stop click our unsubscribe button and you'll be removed from our subscription list. MobileXCo is a marketing services and analytics company that specializes in providing B2C brand organizations with expertise and tools to run digital promotions that are designed to engage consumers, measure results and uncover valuable insights through data collection and analysis.